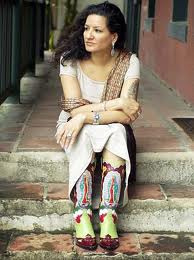 Sandra Cisneros was born December 20, 1954, to Alfredo Cisneros de Moral and Elvira Cordero Cisneros. Her birthplace was the Puerto Rican/Spanish district in Chicago, in the “barrio,” or Spanish-speaking neighborhood. Cisneros’ father, Alfredo, came to America to escape his father and to make a new life in America. Her father upholstered furniture, while her mother worked in factories. In her family, Cisneros was the only daughter; her six brothers usually ganged up on her or ignored her, so she was used to being alone. She lived in poverty for most of her childhood because her parents didn’t make a lot of money. The Cisneros family also moved around often, going from Chicago to Mexico City to visit Alfredo’s family throughout her childhood. Cisneros often felt destabilized, and never felt she belonged to either her Mexican roots or her American upbringing. "The moving back and forth, the new school, was very upsetting to me as a child. They caused me to be very introverted and shy. I do not remember making friends easily" (Hispanic Heritage). In many of her short stories and even poetry she alludes to the “barrio,” or the type of neighborhood her family usually chose to settle for at least a few months. In various interviews, Cisneros has said this setting led her to writing; she didn’t make friends easily, and enjoyed staying indoors as a child. Cisneros received a bachelor’s degree from Loyola University in 1976, and in 1978 gained a creative writing degree from Iowa University. It was in her creative writing courses that she found her voice in writing, and also the limitations of her mixed heritage. In an interview, Cisneros stated: “We’re always straddling two countries, and we’re always living in that kind of schizophrenia that I call being a Mexican woman living in American society, but not belonging to either culture” (Understanding 108). According to Understanding Contemporary Chicana Literature by Deborah L. Madsen, Cisneros work is “characterized by the celebratory breaking or sexual taboos and respassing across the restrictions that limit the lives and experiences of Chicanas” (Understanding 105). Madsen argues that Cisneros wishes to break the longing of Chicanas to be accepted by American or Mexican culture, because it is almost impossible if you are a Mexican-American. Cisneros reveals the conflict between society and women, between women and women, and between women and men. She emphasizes that in Mexican culture, for women, there are two main roles: the virgin or the whore. Cisneros uses main female characters to portray the border between culture and self, and the different identities that come with being a woman of mixed race. 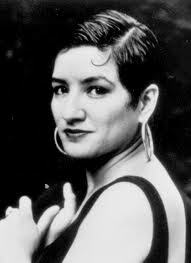 With a Spanish speaking father and an English speaking mother, Cisneros uses Spanish terms frequently in her writing, which gives her a unique edge and voice. In an interview, Cisneros spoke about Dennis Mathis, a fellow writer and friend, who helped her edit some of her work and bounced ideas off with her. “My friend, Dennis Mathis, was reading Eastern European and Japanese experimental writers, and I brought the Latin American writers to his attention, so we exchanged books and bounced off one another. And the good thing about Dennis is, even though he’s a white, he respected that I was doing something quirky with my English. He loved it when I would mix up the Americanisms and say, “That’s water over the dam.” I would get them all wrong. And he encouraged this. He’d say, “No, that’s great.” He didn’t say, “Oh, you know, that’s wrong. You’ve gotta change it.” He was very sensitive about keeping the unique way that I spoke English—it had a lot of Mexicanismsor Mexican syntax. So you keep it in because it’s adding something unique.” (Behar ). In San Antonio, Cisneros dreamed of having a creative writing workshop that was free for the public. She began a creative writing workshop in her dining room in 1995, which turned into the Macondo Foundation in 2006 (Cisneros, Foundation). This foundation helps passionate poets, writers, and performance artists who promote educational stability and a message of non-violence to the community. The Foundation itself recently moved to Our Lady of the Lake University.